Do you have time to loose reading my review ... especially when you have already seen the quote. 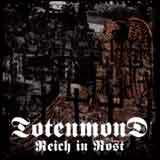 It is a kind of Black / Death Metal in German. Production is quiet poor (drum sound is a joke) and the singer shout as loud as he can. His vocal is ok for me and the first song can be described as a "speedy" roller coast drum ride with some "war" effect in the back. The second one is more heavy, slow tempo, aggressive voice (always clear) ... pretty basic honestly, with the same riff (3 notes) on the bass, you get really tired on this one. At some point I was wondering if I was still listening to Abaddon (see above), but the German language is back to confirm me it is still Totenmond. A copy of In Extremo. If only ! No comparison here. In Extremo is a million times better compare to ...... this. Aaaah, sometimes I am wondering if those guys are not doing this music just to do bad jokes to reviewers.